If you follow me on social media (especially Instagram or Twitter) then you’ll know that I recently purchased my first set of cookware in about 15 years. It was a major purchase and I put a lot of thought and research into the decision, so I wanted to share the process with all of you. As I’ve learned over the years, the quality of your cookware makes a BIG difference in the outcome of a recipe. Although this post does contains affiliate links, I was NOT paid by any brand, manufacturer, or retailer to mention their products or stores. These are my pure, unadulterated opinions. A big portion of my decision was based on my experiences with the cookware that I already own, so let me start with that. I bought my first set of cookware at the dewy age of 20 (or was it 21?). I didn’t know much about cooking or cookware, so I simply went to Target, found a set that looked sturdy, and bought it. The set I bought was the older version of the Simply Calphalon 8-piece cookware set. Despite being a hasty, uninformed decision, the set has served me very well over the years. This is my old sauce pot. It has seen better days. They’ve been beat up, stained, and slightly abused, but have held up surprisingly well. Here is what I liked and disliked about this set. Pro’s: Heavy, thick, one-piece construction that conducts heat evenly. Glass lids that allow seeing the contents without letting out heat or steam. Dishwasher safe. Non-stick surface was surprising durable and did not flake, peel, or scrape (no metal utensils were used). Con’s: Not oven safe due to the plastic handle and non-stick surface. 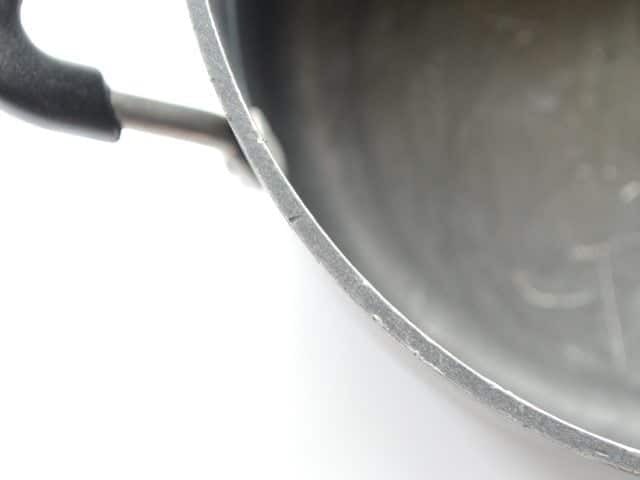 Non-stick CAN scratch if misused. Non-stick’s safety is questionable. The outer surface stains easily. The pro’s definitely outweighed the con’s, IMHO. It was a good set, but they’ve seen better days. I also received a set of stainless steel cookware as a gift from a friend who had received them free for subscribing to some magazine or something. They’re shiny, pretty, good for blog photos, but terrible for cooking. They are as thin as paper and have a “bonded” bottom for heat conduction, rather than being one solid piece. See that extra layer stuck to the bottom? It’s a thicker piece of metal meant to help conduct heat. The problem is that it doesn’t conduct heat up the sides and around food. Womp, womp. 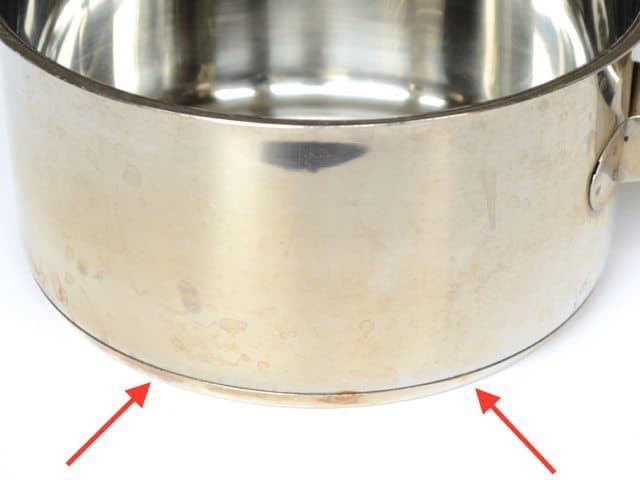 The metal on the walls of the pot are only 1/32 inch thick. Seriously, paper thin and terrible for cooking. Compare that to my Calphalon set, which is 1/8th inch thick and all one piece. MUCH better. The heat flows easily and evenly from the bottom of the pot up the sides and all around the food. That’s how you get even and reliable results when cooking. In addition to these two complete “sets”, I’ve also purchased a few individual pieces over the years, like my Lodge 10″ cast iron skillet. I use that one a lot because, unlike the Calphalon set, it can go from the stove top to the oven with no damage. You can literally use it as bakeware OR cookware. So, after comparing what I liked and disliked about the sets and pieces that I already own, I made a list of “must haves” for my new set of pots and pans. My first decision was whether to buy another set of non-stick, or opt for stainless steel. While I enjoyed the ease of my non-stick cookware, I kind of felt like the teflon was a safety net that I no longer needed. Now that I’m more experienced and understand the cooking process better, I know how to keep food from sticking without the help of Teflon. I no longer need my training wheels. Plus, I wanted the flexibility of going from stove to the oven or broiler, or using metal utensils without the fear of scratching. (I might keep one small non-stick skillet for fried eggs, though. ;) ) If I had decided to stay with non-stick, I may very well have just purchased the very same set of pots and pans again, except the bigger set that includes this deep skillet with lid. I liked them that much. I was so impressed with my first Calphalon set that I went straight to their website to see what else they offer. I found this awesome comparison chart of their different stainless steel cookware sets, which helped a lot. It had columns for most of the items on my “must have” list (they have a similar chart for their non-stick cookware sets). Simply looking at the chart helped me understand what I wanted and what I should be looking for, regardless of the brand. 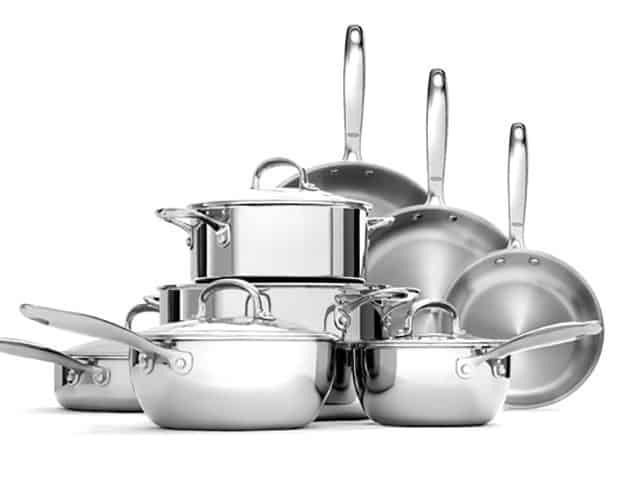 From that chart, I was able to see that the only Calphalon set that met all my “must haves” and was within my price range was the Calphalon Tri-Ply Stainless Steel set. Unfortunately, the smaller 10-piece set did not have all the pieces I wanted (I NEED that deep skillet with lid) and the large 13-piece set was out of my price range. How did I plan to fix that? A coupon. It had all the things on my list that I wanted: stainless steel, one-piece construction, glass lids, oven/broiler safe, dishwasher safe, AND the deep skillet with a lid. They have the same tri-ply construction as the Calphalon set and the lids seemed like they fit a little better. They also had a few extra bells and whistles, like volume marks on the insides of the pots, and a gorgeous rounded shape, which they claim is easier for whisking and stirring, but I just like because it’s pretty. I’m a very visual person, so the beautiful shape totally sealed the deal. All that and they were the same exact price as the Calphalon set. Moral of the story? Always check out the product in real life, even if you plan to purchase online. I am the most excited about this deep skillet with lid. Can you tell by how many times I’ve mentioned it in this post? Over the years I’ve found this to be the most versatile piece of cookware and if I were only allowed to buy only ONE piece, this would be it. End of story. 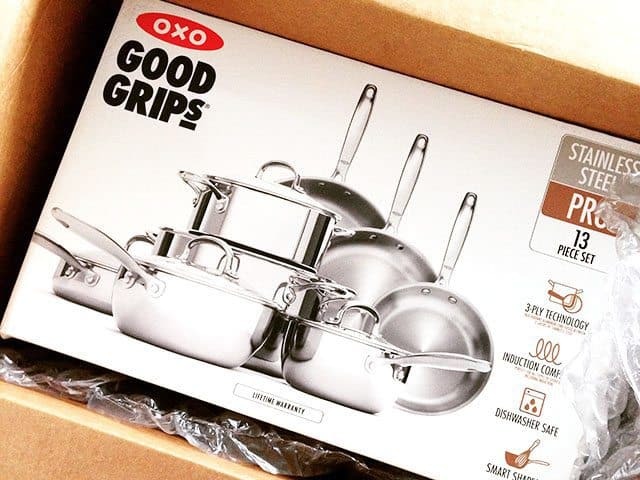 The Oxo set was out of stock at all the Bed Bath & Beyond stores in my area, so I ended up ordering them online. The print 20% off coupons are only eligible for in-store purchases, but I was able to sign up for their text message alerts and get a coupon that works for in-store AND online purchases. The text message alerts can be cancelled at any time, so it was totally worth it (they don’t send the coupon for about a week, though, so be patient). In the end, I got an amazing 13-piece stainless steel cookware set for about $320. That is a steal! (Or steel? No? Bad joke.) I love them. They’re beautiful, sturdy, and from what I can tell so far, cook very well. I win! If I had a smaller budget, I would have probably purchased one of the hard anodized aluminum non-stick sets, like my old Calphalon set simply because they’re still thick and heavy, but cost much less than the stainless steel. OR, I would have checked out a stainless set that had the bonded bottom, but made by a more reputable brand. I have a feeling that not all bonded bottoms are quite as bad as the free set I was given, so that would be worth looking into. If you have a very tight budget, consider looking in thrift and consignment shops for cookware. A good set of cookware can last generations, but people usually don’t keep them that long just because they want or are given something new. You can score big on some very durable used stainless steel or cast iron pieces. Even if a piece of cast iron looks rusty and shot, it can sometimes be restored with a little TLC. Also check out restaurant supply stores. They carry bare bones, sturdy cookware that gets the job done well, without the celebrity/brand names or the bells and whistles that can hike up the price. That was my experience, what’s yours? 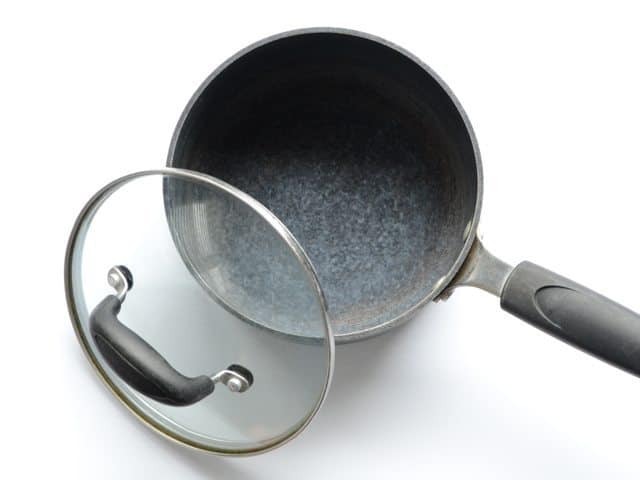 Share your thoughts, experiences, and advice about buying pots and pans in the comments below. We can all learn from each other! Thanks for sharing this informative article. It’s very helpful. I would like to mention few things I have learned with experiencing couple cookwares. I have made bad choices in past and wasted much money on useless cookwares since I always looked for design first and sadly, there was no one to guide me or advice me. Whenever I plan to buy a new cookware either for replacement of old one or for family, i follow mostly all tips you have mentioned already, but the first thing I always check is the material coated with, I try to stay away from Aluminium as much as possible, as it’s very risky and dangerous for health. Aluminum can react with food and lead to toxicity. Also, I check their lids, as I have bought some cookware before, and their lids “pop off” quickly after a short time. and I make sure to stay away from heavy lids especially if I’m planning to gift that cookware to family or friends. Just wanted to chime in that I bought an incredible set of tri-ply stainless steel from Wal-mart of all places. The brand is Tramontina and they are to die for! Huge skilllet, two great saucepans, 12” and 10” fry pans, 2 stockpots all for $300! They were also the America’s Test Kitchen runner up to the extraordinarily expensive All-Clad set. The lids aren’t glass but my previous set had glass and they always steamed up when cooking so I always had to lift them anyway. The handles are so comfy too and oven-safe. I can tell I’m going to own these for many years to come. I know this is a really old post, but am wondering if you are still happy with this set. I’ve been considering the set for a while now. Thanks!! I’m still very happy! :D No regrets with this set. How do cook in stainless steel cookware without it sticking, my sister and I love to cook, by the way I love love love your food blogs, and we were looking at cookware and I mentioned to her that you had the blog about buying your newest set. One thing that I find that helps is to let it heat up first, then add the oil. Let the oil get hot (this happens super fast since the skillet is already hot), then add your food. If you’re cooking meat, it will stick at first, but once it’s achieved a good brown crust, it actually releases. Then, I usually deglaze the pan with some sort of liquid that helps dissolve any stuck bits from the bottom. There are only a few things that I still don’t like to cook in stainless, just because they are more likely to stick and just require much more oil or butter (like eggs). I was wondering if you have posted or have any information about what to do with a new cast iron skillet. I just received my first one and to be honest I hate it! Everything burns in it and I hate not being able to wash and scrub it. I also have been avoiding using it because everyone has their own opinion about how I should care for it. I do not know what will actually make it easier to use. My cookware set was a jumbled mess of teflon pans that a previous roommate had scratched, despite my careful care, and odds and ends collected from family as I went through college. A dozen years ago, I was working for a company that trained chefs, so while I wasn’t cooking myself, I learned a LOT, and made a lot of good chef friends. When my boyfriend proposed, and it came time to set up a wedding registry, we opted not to pick a set of plates and tableware. After consulting with my chef pals, and doing some of our own research, we mostly filled our registry with cookware and knives. We chose All-Clad, in part because of the quality, but also because it is made in PA, where my husband is from. I LOVE my All-Clad! But it is expensive. A friend thought I could use some extra saucepans, and bought me two by KitchenAid, but they don’t compare. They don’t cook evenly, and if I cook anything higher than medium, the handles get too hot to touch! Yikes! We have a mix of All-Clad (wife is a former chef and had picked up pieces slowly over the years before I met her) and a box set my mom bought me when I moved out. Both have served well. Plus the GIANT stock pot my friend bought us for our wedding (her family owns a restaurant so it’s one of the heavy duty no frills pieces that you mentioned, but it’s a giant stock pot so it does exactly what it needs to!!). Toss in a cast iron pan (2 sizes) and you’ve got my kitchen. The newest piece is the sauce pot I bought Wife for her birthday 4 years ago. Otherwise the rest is 8+ years and still in perfect shape. Absolutely worth it to buy good quality stuff!! It would really like to see a how-to on buying a set of good knives for the kitchen. I’m glad to see this post and all of the remarks! I’ve been researching new cookware to replace my poor 10 year old anodized Calphalon that’s bit the dust. That Tramontina looks interesting and I might have to take a better look at the brand as I’ve never heard of them before. Right now I have some cobbled together tri-ply Calphalon pieces that were gifted to me by various relatives that didn’t like them. As a running joke with my mother, I’ve asked her to will me her All Clad collection and her Pampered Chef baking stones as this will be the only way I can afford either! All Clad cooks so perfectly, but boy is it spendy. We lucked out with a cobbled together set of Revereware pots and pans, thanks to my in-laws. They’re sturdy and can take a lot of abuse, as long as I don’t scorch them (haven’t done so yet! ).